Successfully Added Pen Pinhole Video Camera (Motion Detection, 2GB Micro SD) to your Shopping Cart. 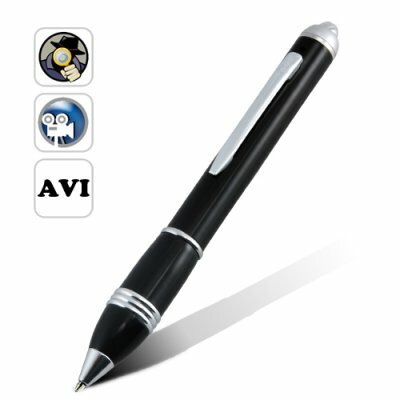 Capture high resolution hidden video with our newest pen for 2010. The real fun starts when you switch the motion detection to "ON". Then place it on your office desk or nightstand when you leave the room and wait for it to record video at the first sight of movement. You may be surprised at what you might capture! Or you can even clip it to your shirt pocket to capture your boss or husbands abusive behavior for legal disputes. With the easy one button operation you will always be ready to capture high quality hidden videos within a moments notice, any time any place. The I59 uses a MicroSD (free 2GB included) card slot for video storage, so memory limitations will never be a problem with this amazing pen. Simply load a new SD card in when the current one becomes full and you can continue capturing hours of undercover video without suspect! Order the I-59 Pen Pinhole Video Camera (Motion Detection, Micro SD) in bulk now while it is still in stock and ready for next day shipping! Only from the leaders in wholesale electronics, Chinavasion! Functions as a USB storage medium, writing pen, and pen. Very high quality gadget, writes great. This product also records audio, so you don't have to worry about switching between audio and video modes. I have had to order a second camera for my mother. I took the first camera out and filmed a day out around a holiday area just to test the camera. It worked so well that I instantly thought of many other uses for it. Unfortunately, so did my mother. So I have ordered, received and set up a second camera for her. Fantastic product for the price. Nice clear pictures (if you don't move too fast), and best of all...no one knows it is a camera. I find that cliping it to a folder and carrying the folder lets you have greater control of where you are pointing the camera, but still keeping the secrecy of the camera hidden. I think just the fact that I have 2 of them says enough. I received my pen and managed to get it working with little trouble. It is good for recoring meetings, or anywhere, that cameras are not allowed. I can think of a lot of uses for this camera, and unlike the big cameras I have, that are not allowed into certain areas, this one writes as well. A piece of black tape over the recording light will guarantee secrecy.